Ban Mueng Ka Community Located at Moo 5, Saluang, Mae Rim, Chiang Mai. There are Lua community. It’s the same period with Haripoonchai. Until Khun Luang Wilangka pass away. There is no successor to rule the country. The rest of the people built the town. 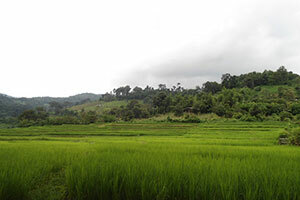 Until around 1925, the disease was repeatedly hatched a few villagers after the household in 1974, it was established as a village, Moo 5, Saluang District, Mae Rim, Chiang Mai. Until now. For Transport From Mae Rim District to Ban Mueng Ka about 30 kilometers. It is believed that. In this village, there is a shrine of Khun Luang. And the left and right troops of Khun Luang 2 more courts. The villagers will give their souls, spirits, and soldiers once a year. The villagers said. The spirit of Khun Luang will be in 3 places. They are on Doi Kuam Lon, Ban Muang Ka Court Mae Rim and the other is Doi Kham, Muang district, south of Doi Suthep. At the top of the hill there is a temple called “Wat Phra That Doi Kham” On this temple there is a monument of Khun Luang Virang Ka. Temple near the pagoda.